We’re only two weeks from the start of the 2018 NFL season and instead of wasting time watching meaningless preseason games, this time of year presents a great opportunity to do a little homework in preparation for the season to come. I like to start my studying by conducting a detailed analysis of the regular-season team win totals posted by the sportsbooks. When handicapping NFL win totals, I predict the outcome of every game on the entire 256 regular season game schedule (yes, I am a dork) by assigning each team an appropriate percentage chance of victory in each game. For example, if I think there is a 90 percent chance that New England defeats Houston in Week 1, I assign a value of 0.90 to New England for that game and a value of 0.10 to Houston. Generally speaking, I prefer this method in lieu of a simple “win” or “lose” approach (where you would assign a value of 1.0 to New England and a value of 0 to Houston) to come up with what I believe to be a more accurate prediction. In applying this method, only two of my projected team win totals deviate by more than 1.0 wins or losses from the posted number. While this may be coincidence, I would guess that oddsmakers employ this approach, along with a number of other factors, such as public perception of a team, when hanging these totals. Some people may have a vague recollection that Atlanta blew a 28-3 lead in the 2016 Super Bowl. 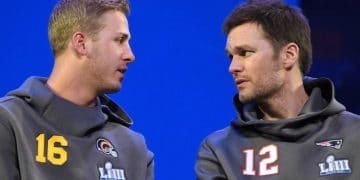 Despite this, the Falcons managed to shake off a mediocre 3-3 start to the 2017 campaign, posting a 10-6 record and upsetting the Los Angeles Rams in the wild-card round before bowing out in the divisional round to the eventual Super Bowl champion Eagles. 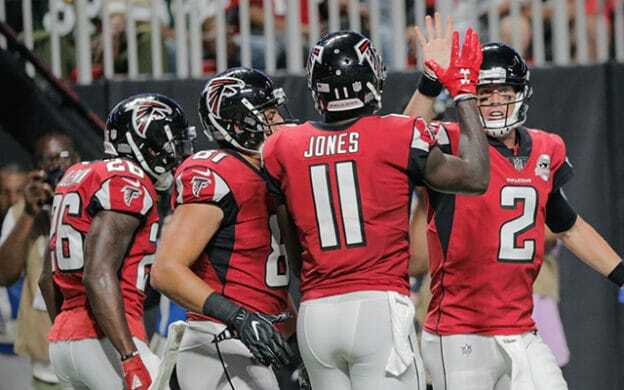 With the benefit of a third-place schedule and the perennially prolific duo of Matt Ryan and Julio Jones, the Dirty Birds come out of the gate with early tests in the first three weeks this season, with a road opener at Philadelphia followed by home games against Carolina and New Orleans (in which they will be favored). The schedule then eases significantly, thanks to a third-place finish in the NFC South in 2017, and is filled with a series of extremely winnable, non-division home games against Cincinnati, Baltimore and Arizona and road games at Washington and Cleveland. The Falcons have seven games where they will be heavy favorites (note: there are no guaranteed wins in the NFL, unless you were playing the 2017 Browns) and only need to find three more wins to cover the total of nine. I can’t see them being more than a 4- or 5-point underdog at any point in the season and with a few bounces going their way, I could easily see the Falcons having the opportunity to blow another huge lead in the Super Bowl. Projected regular season record: 10-6. Trevor Siemian (now a Viking), Brock Osweiler (now a Dolphin) and Paxton Lynch (still a Bronco, booed by fans during last preseason game). These are the types of names that make you feel thankful that your team was able to win five games in a season. 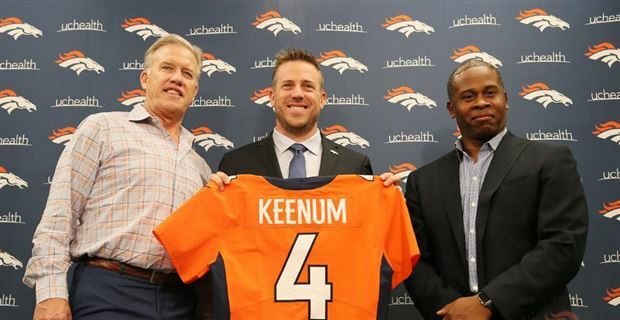 Fortunately for Denver fans, the Broncos were able to sign free-agent QB Case Keenum to replace the “Three Stooges” that Denver trotted out (see what I did?) last season at quarterback. There is no doubt that Keenum had a terrific year in 2017 for the Vikings, throwing for more than3,500 yards and boasting an impressive 22 TD passes against only seven interceptions. Keenum played behind a functional (and heavily upgraded from the season before) offensive line in Minnesota with excellent receivers and in a quality offense on a team not coached by Jeff Fisher. It makes you wonder why the Vikings didn’t think twice about letting him walk. While unquestionably an upgrade under center, Denver’s offensive line allowed 52 sacks in 2017 and Keenum is not only short (listed at 6’1” but is likely half a foot shorter), but has had knee surgery (ACL), so he’s not exactly mobile. Bearing a heavy burden, Denver’s defense in 2017 was a shell of its Super Bowl 50 form, finishing 22nd in both sacks and points allowed, and it may now have taken a step backwards with the trade of cornerback Aqib Talib to the Rams. Looking at the Broncos’ schedule, there are quite a few games that will be virtual “coin flips” and I don’t think Denver will be favored too often this season (possibly only at home against Cleveland in Week 15). With too many question marks on both sides of the ball, it’s hard to see the Broncos being able to add three wins to their 2017 total by posting the eight wins it would take to hit the over. Projected regular season record: 6-10. Although it has only been one year since their move up the Pacific Coast Highway to a 28,000-seat soccer stadium, it appears that people are forgetting that the L.A. Chargers are still the same San Diego Chargers. In fact, I heard a few somewhat sober people in Vegas say that they think that the Bolts are a sleeper to make a run to the Super Bowl. While the posted total of 9.5 is only slightly higher than their 2017 record (9-7), the Bolts haven’t reached the playoffs since 2013 and haven’t won the AFC West since 2013, which is also the last time they won the 10 games needed to push the win total to the over. 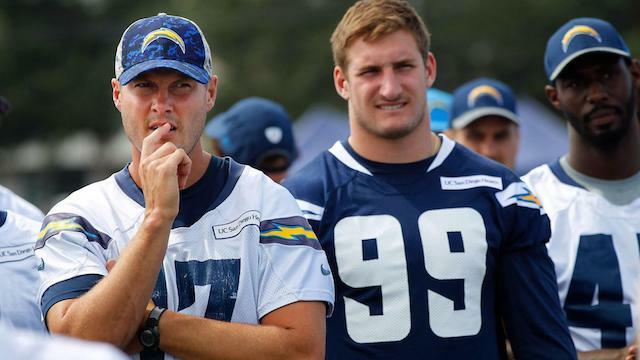 Fans have been subjected to consistent mediocrity behind Philip Rivers, who certainly shouldn’t be expected to morph into Tom Brady anytime soon and is facing his first season without safety blanket Antonio Gates (who was allowed to walk after 14 years with the team). While I do think that L.A. will be small favorites in nine of its games, it’s not out of the realm of possibility that the Chargers will begin the season 1-4 with home games against Kansas City, San Francisco and Oakland and early road tests at Buffalo and cross-town rivals, the L.A. Rams. The Chargers also have a tough home game against the Titans (another trendy Super Bowl pick) and additional road tests against the Browns (not a typo), Seahawks, Raiders, Steelers and Chiefs. In analyzing L.A.’s schedule, there is a FAR better chance that I call them San Diego 10 times before Week 1 is over before they win 10 games this season. Projected regular season record: 8-8. The Eagles fly into the 2018 season off a thrilling Super Bowl win over the widely despised Patriots and are no longer under the radar. 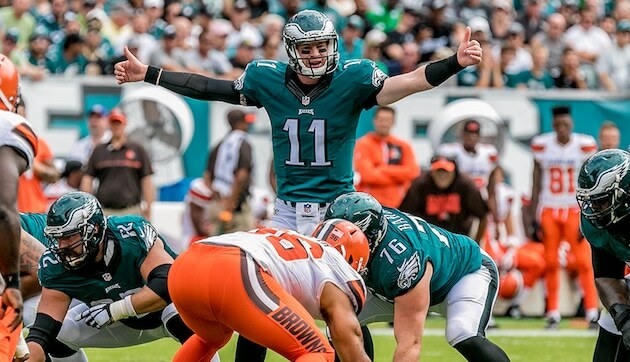 Philadelphia finds itself in the curious position of benching a Super Bowl MVP in QB Nick Foles in favor of franchise favorite Carson Wentz, whose 2017 season ended with a torn ACL and is expected to be ready for Week 1. Overall there aren’t many holes on either side of the ball. With this, the Eagles enter the season as strong favorites to win the NFC East (-155 favorites) for a second year in a row and are listed among the top choices to once again hoist the Lombardi Trophy. 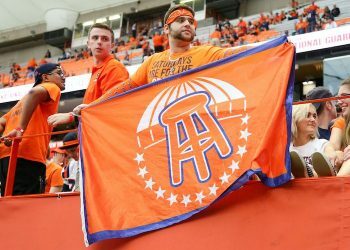 This presents a great opportunity to “fade the public,” as they will undoubtedly be all over the Eagles this season as they defend their title. Winning the Super Bowl has its price, as Philadelphia’s non-divisional schedule is absolutely brutal. The Eagles open at home with the Falcons and face non-divisional road tests at Tennessee, Jacksonville, New Orleans and the L.A. Rams, all likely playoff teams. Add in non-divisional home games against Minnesota, Carolina and Houston, also all likely playoff teams, plus a couple of games against bitter rival Dallas, and you wonder how any team with this schedule could possibly soar over the 10.5 win total. Projected regular season record: 9-7. Barry McFadden is a co-founding partner of Greathouse Holloway McFadden PLLC in Houston, Texas and has significant experience representing clients in the gaming and sports betting industry. In addition to his legal practice, Barry and a partner finished in 3rd place in the prestigious Westgate Las Vegas NFL SuperContest in 2015, besting nearly 1800 other entrants for a payday of $181,335. Follow him on Twitter @fade_material.